Stop at CHRB CALMETTE which is the final station. 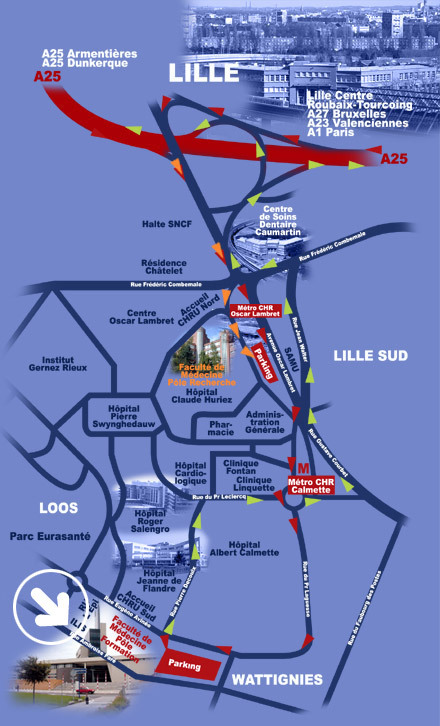 At the heart of the Paris-London-Brussels triangle and thanks to the TGV high speed train network, the motorway network and the Channel Tunnel, Lille is located less than 350km from 6 European capitals. As a cosmopolitan, eclectic, cross-border European megalopolis, the Lille metropolitan area is home to more than one million inhabitants. Resolutely turned towards the future, Lille (a city with a tumultuous and eventful history) has nevertheless proudly kept its traditions, its roots and its identity. As well as being a city of art and history, a conference venue, a university city and a major economic, financial and administrative centre, Lille is no less a tourist destination offering its visitors and inhabitants a range of entertainment activities and an intense cultural life. The city invites you to discover its many museums, monuments and historic buildings as well as numerous sports and leisure facilities. Lille's ever-growing student population and educational demands have necessitated the construction of a new university building - the Henri Warembourg Faculty of Medicine. This elegant, modern edifice, located on the southern edge of Lille's vast university hospital campus, bears out the Lille Faculty of Medicine's dual determination to maintain continuity whilst introducing change. The new complex is fully equipped for welcoming people with special needs.